If you haven't tried Sriracha yet, well... why not? If you're a true foodie you've probably been hearing about this for a while, maybe you've tried it, maybe you put it on everything you eat/own, or maybe you've been waiting for an awesome recipe like this to get on board. Sriracha is a hot chili sauce identified by its iconic rooster on the front and green cap; you'll most likely find in your local grocer's international aisle (in the Asian food section). It was created by a Vietnamese man after he moved to California, and it has quite the following. In fact, there is a Sriracha cook book (with a blog that also features funny posts from other Sriracha enthusiasts). I feel like I'm a little late getting on board the Sriracha train, but since I bought our first bottle of Sriracha hot chili sauce about a month ago, I've witnessed my husband put it on his breakfast, lunch, and dinner (in the same day). The thought that has come to many foodies that have tried Sriracha - what if I made hot wings out of this delicious sauce? I don't know how I would describe the flavor of Sriracha - it's much better than hot sauce as it doesn't have that vinegar-y taste, it's thicker, it's slightly sweet, and it's just really delicious. This recipe cuts down on the heat with some honey and other ingredients for a sweet and spicy and garlicky wing. It's got a good amount of heat so adjust accordingly if hot hot wings aren't your thing. Preheat oven to 400 degrees F. Pat wings dry and place in large mixing bowl. 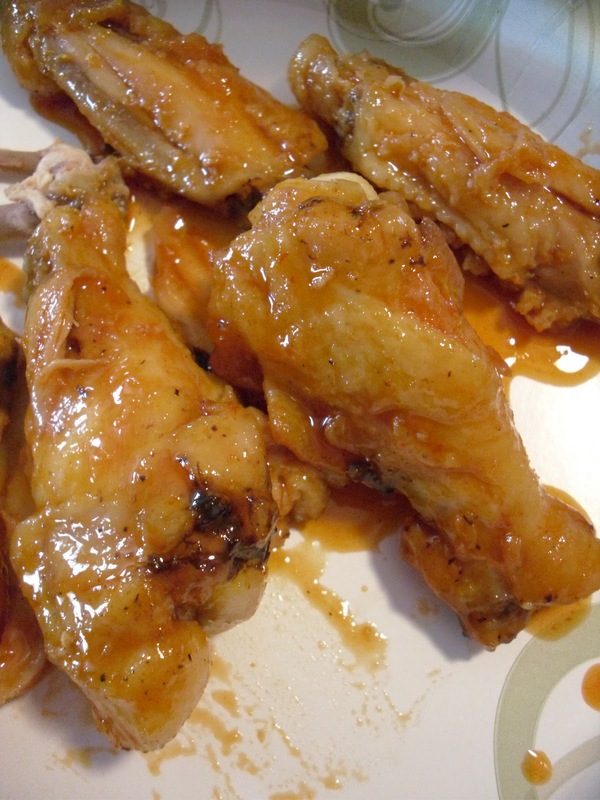 Combine vegetable oil, butter, garlic and ground pepper and pour over wings. Toss wings to coat. Arrange wings in single layer on baking sheet covered with non-stick foil or in non-stick foil pan. Bake for about 45-55 minutes, turning over halfway through. Meanwhile, begin the sauce by placing butter and garlic in small pot or saute pan over low heat for several minutes. Add remaining sauce ingredients and increase heat to medium, stirring to combine. Simmer sauce until reaches desired thickness (this may take anywhere from 10-20 minutes), stirring frequently. Remove from heat and set aside. Once wings are golden brown and crispy, remove from oven. Combine with sauce. Serve with blue cheese dressing and celery, if desired. Wine Pairing: I didn't actually have wine with this meal. Instead, I reached for Harpoon's Irish Style Red Ale, which I thoroughly enjoyed. However, if I had to vote for a wine here I think I would go for a Gewurztraminer which would have enough sparkle and sweetness to compete with the flavors of this meal. Always good to find a tasty wing recipe that does not call for deep frying. The sweet and heat style sauce looks to be very tasty. Well worth a try-thanks for sharing.